Brief Encounter is a 1945 British film directed by David Lean about British suburban life, centering on Laura, a married woman with children whose conventional life becomes increasingly complicated because of a chance meeting at a railway station with a stranger, Alec. They inadvertently but quickly progress to an emotional love affair, which brings about unexpected consequences. 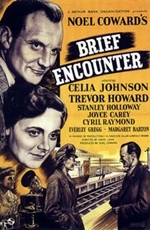 The film stars Celia Johnson, Trevor Howard, Stanley Holloway and Joyce Carey. The screenplay is by Noel Coward, based on his 1936 one-act play Still Life. The soundtrack prominently features the Piano Concerto No. 2 by Sergei Rachmaninoff, played by Eileen Joyce.